The Symposium is officially on! 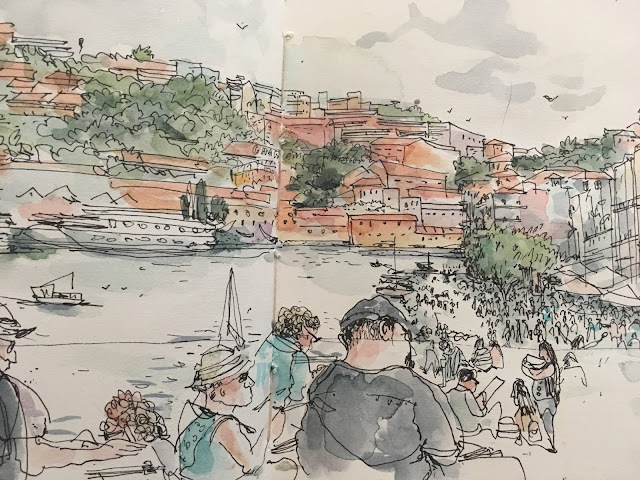 [By Rita Sabler, Symposium Correspondent, in Porto] In the morning hundreds of sketchers lined up patiently in the Alfandega building that houses the symposium to get their badge, a bag of goodies, and the symposium program. For hours the amazing volunteers and the organizers worked like a well oiled machine to get everyone checked in and situated. I sketched a lineup of symposium bags that hold such treasures as new pens and pencils, sketchbooks, and other fantastic surprises provided by the symposium sponsors. On the outside of the registration room there was an equally long line of people waiting for their turn to enter the registration room. After lunch it was time for the first official sketch walk of the symposium. I headed to Ponte Luis I. As I walked along Douro waterfront there was a steady lineup of sketchers all the way to the bridge for about a mile. It was something truly spectacular to witness. Some were sitting in groups, others squatted down alone on the sidewalks, little stools, or outdoor cafes people were bending over their sketchbook, making beautiful marks on the empty pages, as a mirror reflecting the unique beauty of this city, its azulejo tiles, its colorful facades, its laundry drying in the wind, its beautiful people. Finally I reached the Ponte Luis I bridge and sat down with my sketchbook to capture the panorama of Porto with thousands of people, many of whom were sketching, the mighty Douro, the wine bodegas on the other shore, and the boats used to transport the barrels of port. After a few hours of sketching and an obligatory group photo we headed back to Alfandega where the opening reception was starting to take place. I sketched the opening remarks by Amber Sausen, USK President. We learned that 800 people from 46 countries have officially registered to attend, with rumors speculating that another 800 are coming sketch in Porto making the 9th Symposium by far the biggest symposium so far.